The Greater Bandon Association has named the September recipient of its Volunteer of the Month award. Horty Joyce becomes the eleventh winner of the new award. 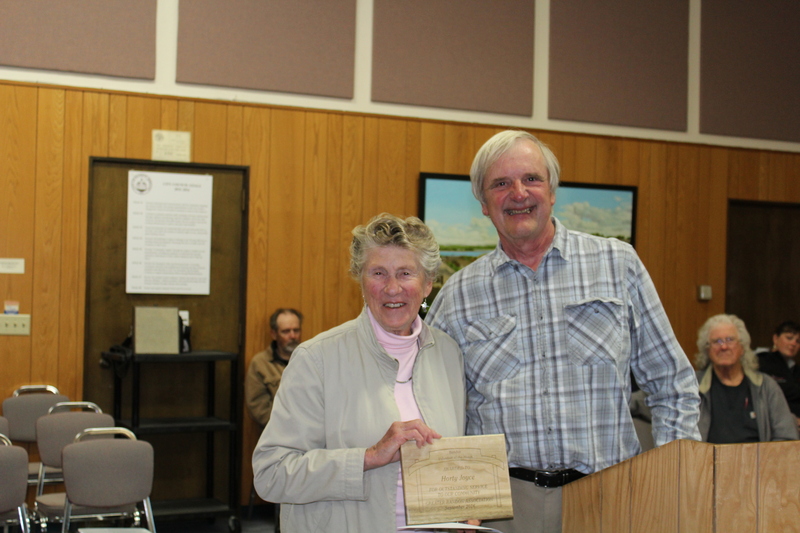 She was presented the award in the form of a plaque and a gift certificate donated by Winter River Books at the September 12th meeting of Bandon’s City Council. Horty has put in long hours for many years for the Bandon Library Friends and Foundation. She is highly regarded and well liked by staff and users alike. She is the Foundation’s Chair for membership, booksales and film night. Horty has become very active in training dogs to find lost people and pets. She is secretary for Bandon Animal Recovery K9S. Horty also volunteers at the Visitors Information Center for the Chamber of Commerce. The Greater Bandon Association will be honoring one of Bandon’s many volunteers that are making a difference in the community each month. Nominations for the April award should be e-mailed to dana@greaterbandon.org mailed to P.O. Box 161 by close of business on September 23rd, 2016.